Democrats: Is It Time To Panic? Those who saw Mitt Romney eviscerate New Gingrich in the debate just prior to the Florida Republican primary likely weren’t surprised by Mitt’s strong performance against President Obama on Wednesday night. Although Mitt has been justly cited for marring his debate performances with the occasional off-hand – and off-message – line (see: I like firing employees, buying Cadillacs for my wife and killing Big Bird), he has also exhibited an ability to devise and implement a debating game plan based on staying focused, sticking to his message, driving his points home and utilizing opposition research to put his opponents on the defensive. All these traits were on display Wednesday, and he more than met my expectations that he would do well. But if Mitt’s performance did not surprise me, Obama’s did. While perhaps lacking the superior debating skills of a Gingrich, Obama showed in his three debates against John McCain, and against his Democratic rivals during the nomination campaign, that he is more than competent on the debating stage. Most observers thought Obama won all three of his general election presidential debates in 2008. But even many Democrats conceded that Obama did poorly on Wednesday. In the debate post-mortem, Obama’s defenders put forth a variety of explanations for the President’s underwhelming performance, beginning with Stephanie Cutters’ effort in the spin room to implicitly blame moderator Jim Lehrer for not putting a stop to Romney’ s bullying tactics. Al Gore – he of the 2000 debating “sigh” – suggested the President had not fully acclimated to Denver’s altitude. Even less plausible was the argument voiced by many on left-leaning blogs that Obama was engaged in some “deep game” designed to lull Team Romney into complacency. I suspect the explanation is far more prosaic. Certainly the President look fatigued, which given the demands of his job is quite understandable. In 1984 Ronald Reagan submitted a turkey of a first debate performance, and his wife Nancy argued strenuously that her Ronnie had been overworked with debate preparation while simultaneously carrying out his day job. Reagan cut back on his workload, started the second debate with a memorable joke that addressed the whispering campaign about his age and also cracked his opponent up, and sailed to victory. Part of Obama’s poor performance, however, may also be attributable to contextual factors that affect all incumbent presidents: the need to defend a record. Romney did not miss many opportunities to point out that the economic recovery has been slower than expected during Obama’s time in office. As I noted in my previous post, two of the three previous incumbents dating back to 1992 running for reelection lost polling ground after their first debate, and in the aggregate the three dropped slightly more than 1% in their polling average (note that I had that figure wrong in my initial midnight post), and about the same amount overall after all three debates. To be sure, they weren’t each running on equally bad records, but they still had to play defense, at least on some issues. Similarly, the incumbent party’s candidate has lost a shade less than 1% on average in the pre-to post-debate polls dating back to 1988. So we shouldn’t be surprised that Obama, as the incumbent, didn’t clean Romney’s clock in the first debate – incumbents rarely do. Nor should we overreact to Obama’s “loss”. Going back to the Kennedy-Nixon 1960 debates, Gallup’s polling numbers show that it is rare for a candidate trailing before the first debate, as Romney was, to pull ahead to win the race. The three exceptions based on the Gallup data are Kennedy in 1960, Reagan in 1980 and George W. Bush in 2000. So, the next iteration of this pattern shouldn’t take place until 2020! Of course it is not clear that the debate, by itself, had as much to do with Reagan’s 1980 victory as did the Iranian government’s announcement that they would not release American hostages prior to the Election. In 2000, of course, Al Gore won the popular vote. And Kennedy only trailed Nixon by 1% prior to their first televised debate. So it would be surprising, but not unprecedented, if Romney pulled ahead on the basis of his performances in the three debates this fall. However, I have been arguing for some time that the economic fundamentals suggest that this race will be quite close come November 6th and that the swing state polls showing Obama with a nearly unbeatable Electoral College edge right now are likely going to tighten, coming into closer alignment with national tracking polls, as more individuals begin focusing on the race. For this reason, I have suggested paying less attention to swing states, and more to national tracking polls. To be sure, my view is not shared by all (Most? Any?) of my political science colleagues. For example, Emory political scientist Drew Linzer, whose election forecast website is a must read for anyone interested in the state of the current race (and whose work is completely transparent!) doesn’t think the presidential race is close at all. Instead he has Obama ahead by a comfortable margin in the Electoral College. Based in part on the polls, Drew argues, “If anyone tries to tell you the presidential race is close, don’t believe it. It’s just not true.” My claim, of course, is that those swing-state polls will begin to tighten in relatively uniform fashion, and in fact there was evidence that they were doing just that prior to Wednesday’s debate. Moreover, if the debate served to focus voters’ attention on the fundamentals, then one would expect the race to tighten even more – if my interpretation is correct. If that happens, of course, the general sense of unease that suddenly descended on Obama Nation two nights ago will turn into a full-scale panic, and we will begin seeing exactly the type of carping and finger-pointing that broke out among Republican opinion leaders like Peggy Noonan, Bill Kristol and David Brooks when Obama appeared to open up a big post-convention, post-“47%” gaffe polling lead. * My message to Democrats tonight is similar to what I told Republicans then: Obama did not lose the race Wednesday night, any more than Bain Capital, or the 47% remark, killed Romney’s chances. Polls ebb and flow in response to media coverage and interpretation of campaign events like debates (although the polls gain predictive power as we get closer to the Election), and forecasting models based on them will respond to those fluctuations in kind. I persist in believing the race will tighten down the home stretch, so that Obama’s final vote total will come much closer to the median political science forecast than indicated by the swing state polls now. Could I be wrong? Sure. (See 1992 and 2000!) That’s what makes this so fun! In the meantime, let the panic begin! *See tonight’s Saturday Night Live! Wonderful parody of MSNBC cast in post-debate meltdown here. Advice To Obama Supporters: Get An Effing Grip On Yourselves! 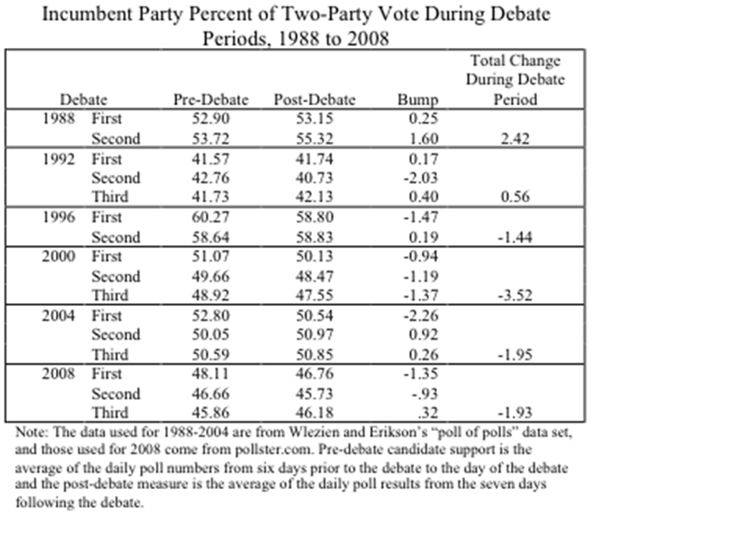 Note that if we look at first debates that involve an incumbent dating back to 1992 (WARNING! N of 3!) 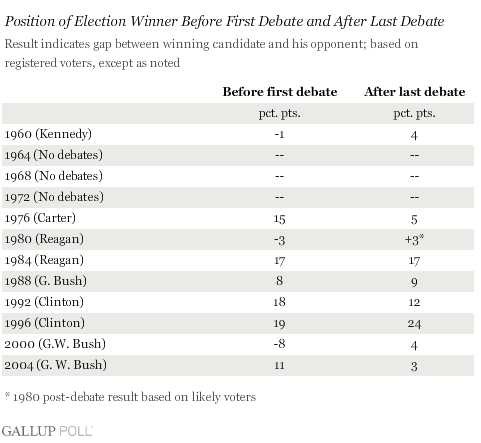 the average loss for the incumbent in the post-first debate polls has been about 1.2%*. Of course, that’s just the first poll – but across three debates (we still have two to go! ), incumbents have lost on average about 1%. So, given that historical record, what is the likely polling impact (notice I said polling –not vote change?) of last night’s debate? Most of my colleagues are suggesting it will be minimal – for example, John Sides is betting that Romney is going to pick up a point or so based on last night’s performance. I think it will be closer to the 2.5%-3.5% range – but that won’t be entirely attributable to the debate (although pundits will attribute any polling gains by Romney in the next week to the debate). Instead, I think Romney was poised to close the polling gap even if last night’s debate had not happened. Look, I acknowledge that I am either going to be the one guy who didn’t get it, or someone who looks impressively prescient (or stubborn) when this is all over, but I have not bought into the media-driven narrative that Obama has been pulling away in recent weeks. In part this is because I tend to downplay swing-state polling in favor of relying on national tracking polls, in the belief that national tides will affect all states – swing and non-swing – somewhat evenly. And the national tracking polls have shown this to be a closer race than have the swing state polls. But the bigger factor is that I’m not yet ready to abandon the political science forecast models just because a bunch of cable guys (and some name-brand prognosticators [you know who I mean]) are convinced that recent polling indicates a drop in Romney’s win probability. Yes, I know that the political science forecasts are predicting a range of outcomes – but as regular readers know, I tend to think the median prediction of the dozen or so models is pretty reliable. In other words, debate or no debate, I think Romney was likely to close this polling gap as we got closer to the Election Day. It is also worth noting, however, that those models, in the aggregate do NOT suggest that Romney will pull ahead. Contrary to what many think, the economic fundamentals do not suggest Romney should win this race outright. The bottom line is I’m sticking by my fundamentals-based methodology that has stood me well in the past. (Ok, maybe not as well as I’d like to think – my forecasts have missed two of the last six elections! Which reminds me: I owe you my traditional forecast. It’s coming, day job permitting) And that methodology says this race was going to tighten no matter what happened last night (barring, of course, a disastrous performance by Mitt.) The fact that Mitt won the debate will likely focus attention on the fundamentals in a way that might accelerate what was going to happen anyway. That’s my story, and I’m sticking by it. Tomorrow (day job permitting) I will explain why Obama lost the debate. In my view, it has far less to do with him, and far more with the institutional constraints that affect all incumbent presidents in their first debate. My unscientific sampling of the twitterverse tweets during the Democratic National Convention’s first two nights of speechifying revealed what seemed like a distinctly lower frequency of instant fact-correcting than what I observed during the Republican convention. That may be because Democrats are an inherently more truthful group of speakers than are Republicans – or it may indicate that my twitterverse feed is dominated by left-leaning pundits. I’ll let you decide. Despite the relative lack of prodding from the twits, however, the main stream media fact-checkers such as Factcheck.org and Politifact.com gamely persisted in informing us about what the former labeled “Democratic Disinformation from Charlotte.” At the top of their list of misinformation? The claim during the first night by keynote speaker San Antonio Mayor Julian Castro and other speakers that Romney would “raise taxes on the middle class”, followed close behind by a misleading claim of job growth under Obama. (The list of false assertions is actually longer, but these two will suffice to make my point.) Factcheck is correct that Romney has made it clear that, contrary to the assertions by the Democratic convention speakers, he will not raise taxes on the middle class. However, as Greg Sargent points out, Romney has promised across-the-board tax cuts in his budget plan while insisting it will be revenue neutral (that is, it will not increase the deficit). It is possible, of course, that he could fulfill both promises, but to do so would probably require an unlikely combination of rapid economic growth and a significant alteration to the tax code that eliminates or changes many current exemptions, deductions and loopholes. The problem for fact-checkers is that Mitt has yet to specify what those changes to the tax code might be. A study by the independent Tax Policy Center that tried to reconcile the competing claims in the Romney budget plan, while stopping short of endorsing the Democrats’ charge that Romney must raise taxes on the middle class, concluded that the only way for Romney’s budget to include tax cuts for all and not add to the deficit is by eliminating current tax exemptions for the middle class. That sounds suspiciously like a version of a tax hike. So, did the Democrats really misstate the facts? Or did they highlight inconsistencies in Romney’s budget proposal? Or both? Not surprisingly, Republicans and Democrats slice that data differently. Like Paul Ryan, Castro might not have been “lying”, but clearly he was shading the facts in a way to make Obama’s job creation record look better. But isn’t that the point of a convention speech? In defense of Castro’s spin, the economy is creating jobs and has been for many months (albeit more slowly than one might like.) And one might argue that Obama’s policies prevented an even worse job loss – most economists argue that without the stimulus bill the number of jobs lost would be even greater. Shouldn’t Obama get some credit for this? Isn’t that the point Castro was trying to make? Look, I have nothing against the efforts by independent factcheckers at sites like this to police politicians’ statements in order to catch the most egregious errors. But as I hope I’ve demonstrated in these last few posts, once the factcheckers move beyond simple factchecking and attempt to compensate for partisan-induced “misleading statements”, they enter a deep thicket of half-truths, spin, and rhetorical excess that makes it almost impossible to locate the “truth.” Moreover, we are naive if we think the partisan bloggers living in the twitterverse will, through the wonders of “crowd sourcing”, hold politicians’ feet to the fire and elevate the accuracy of political discourse. Instead, the evidence so far suggests that the twits in the twitterverse are largely reinforcing the partisan spin that characterizes political debate today. They are awfully quick to point out the other sides’ misleading statements, but perhaps a bit slower to hold their own side accountable. It is a reminder of the old adage that there are three sides to every story: yours, mine and the truth. A final thought: if Factcheck and Politifact really want a challenge, I dare them to enter the twitterverse and try to hold participants there to some standard of “truth” in real time! As the journalist Herbert Agar reminds us, “The truth that makes men free is for the most part the truth which men prefer not to hear.” The denizens of the twitterverse, it turns out, are particularly hard of hearing. P.S. Sorry about the last-minute decision to live blog last night, but Clinton is such as charismatic figure that I fell under his spell and couldn’t help myself. I realize some of you wanted a deeper analysis of the particulars of his speech, but I was trying to view it not as a partisan supporter, but as an undecided voter who might be tuning into the convention for the first time. First impressions can matter. (Also, I was trying to put together a course syllabus while tweeting and listening to the Big Dog Bark. There’s a reason I caution my students not to multitask!) I’ll say more about Clinton’s speech in a later post. In what is likely the peak for his post-convention polling bump, Mitt Romney yesterday edged ahead of Barack Obama in the composite polling at the Pollster.com website by a scant half a percentage point, at 46.6% to 46.1%. This is the first time Romney has led in Pollster’s aggregate poll against Obama dating back to June 2011 and the start of the election cycle. While perhaps symbolically important to some, however, Romney’s “lead” does not represent much if any real change in the election polling – the race continues to be close to a dead heat. It is also further evidence that Romney received a smaller than historically average polling bump from the Republican Convention. The RealClearPolitics composite poll, where Obama’s “lead” has shrunk to .1%, tells a similar story. Romney’s Pollster.com “lead” may prove short lived, however, as President Obama is likely to get his own small bump from the Democratic Convention, which began yesterday with a night of speechifying headlined by Michelle Obama. For what it’s worth, I thought the First Lady gave a very impressive performance. Most of today’s punditry, however, focused more on her dress and her nail polish. These are, evidently, issues of national importance. Tonight we get to see the Big Dog himself, as former President Bill Clinton takes the stage. I don’t expect him to be given a very long leash by the Obama team – they will want to make sure he sticks to the convention schedule (always a worry with Bill), and doesn’t talk to any chairs. There has to be some trepidation among the Obama people that Bill is going to steal some of the convention thunder. It is a sign of just how close this race is that despite these worries, Team Obama is asking Clinton to help out. Frankly, they need him, and his ability to rally working class Democrats back into the fold. One thing I am interested in seeing is how carefully his, and other convention speeches, are “fact-checked” by the denizens of the twitterverse and national media. It is clear to me that the partisan pundits are now using twitter to conduct an initial fact-check of speeches in real time. In so doing, they are establishing a first-take news narrative that the mainstream media, including the various fact-checking sites, feels obliged to respond to. Several of you, in your comments to a previous blog, argued that this instant “crowd sourcing” is a useful check on politicians’ tendency to stretch the truth both by embellishing their own record and distorting their opponents’. This is a point that bloggers are making as well. I confess that I remain skeptical. As I noted in my discussion of the media reaction to the Ryan speech, it would be one thing if the ‘fact checkers” limited themselves to catching obvious errors of fact. But in Ryan’s case they went beyond that to correct “misimpressions” created by his speech. This is a worrisome trend, I think, because it presumes there is a “truth” out there that the often partisan fact-checkers can unambiguously identify. So, many of my colleagues were up in arms when Ryan, in his convention speech, criticized the President for not actively supporting the recommendations of the Bowles-Simpson bipartisan deficit reduction commission. As they correctly pointed out, Ryan was a member of that commission, and he voted along with the other Republican members against its recommendations. My fact-checking colleagues think Ryan should have pointed this out in his speech. But while what Ryan said may have been hypocritical and self-serving, it wasn’t factually wrong. “Fine,” you respond, “but it is important that we identify self-serving and hypocritical statements.” It seems to me, however, that fact-checkers are stepping onto a slippery slope when they go from identifying clear falsehoods to taking on this additional interpretive task. Last night Ted Strickland gave a rousing speech defending Obama’s decision to bail out the auto companies. He also noted that “Mitt Romney proudly wrote an op-ed entitled, ‘Let Detroit Go Bankrupt.’ If he had had his way, devastation would have cascaded from Michigan to Ohio and across the nation. Mitt Romney never saw the point of building something when he could profit from tearing it down. “ It is true that Romney wrote an editorial opposing the auto bailout. But I suspect he would argue it is misleading to claim that “if he had had his way”, economic calamity would have resulted. Should someone correct the misleading impression created by Strickland’s assertion? Or should we chalk it up to the usual rhetorical excesses of convention speeches? Or, consider the question “Are you better off today than you were four years ago?” I can think of multiple, factually correct but quite different answers to that question. For instance, do you think – as many economists assert – that the Obama-backed stimulus bill averted a worse economic calamity? If I’m Obama, I’m going to argue yes. But is that the “truth” – or a self-serving claim? Or both? I don’t see how the fact-checkers can expect to rule on this one. My point is that I’m not sure I want a bevy of partisan-motivated tweeters telling me what is the “correct” answer to this, or other, political questions. But that’s exactly what we invite when we fall prey to the notion that there is an undeniable ‘truth” out there, and that it is the fact-checkers job to tell us what it is. Perhaps the one undeniable fact is that when it comes to political claims, one person’s “truth” is often another’s self-serving assertion. By the way, that was a Tracy Reese dress the First Lady wore last night, and it worked perfectly with her bluish-grey nail polish. And that’s a fact. Is Obama The Strongest Democrat (as Silver Suggests)? 1.First, Obama’s personal favorability ratings, at about 50%, are high relative to his job approval ratings which have sunk to 40%. He suggests that because voters like Obama personally, they may be more inclined to vote for him. 2. Second, Obama’s low approval ratings are higher than they should be given voters’ generally pessimistic view regarding the state of the nation. Conclusion? See point one. 3. Third, there’s no reason to think any other Democrat would be able to “shed Mr. Obama’s liabilities on the economy.” Moreover, his policy views track very closely to the “typical” Democrat in Congress. So, even if another Democrat ran, “the message would be mostly the same – but delivered by a Democrat who was probably no more effective than Mr. Obama, and who would lack the aesthetic and tactical advantages of being an incumbent president”. Silver adds a final thought: that if Obama voluntarily stepped down he would be viewed as a “quitter” and – citing the historical examples of Truman in 1952 and LBJ in 1968 – there’s no reason to expect that his replacement would do any better. Silver makes an interesting argument, but in the end I am not yet persuaded that he is right. To begin, as I have discussed repeatedly at this site, political science forecast models based on the “fundamentals”: – war casualties, growth in disposal income, changes in GDP – leave little room for the impact of candidate “favorability” ratings on electoral outcomes. This actually is consistent with Silver’s third point, if not his first two – that any Democrat will be hobbled by the same conditions that, as of now, put Obama’s reelection in doubt. However, it is possible that in a very close race – and right now several of the forecast models suggest 2012 will be such a race – a candidate’s favorability ratings might matter at the margins. Rather than assume that Obama’s comparatively high favorability rating make him the de facto strongest candidate, however, we should see if any other Democrats are viewed even more favorably? Thinking, thinking….why yes! Hillary Clinton’s favorability ratings have been consistently in the mid-60% range, significantly higher than Obama’s, dating back to the end of 2009 (as have her approval ratings). Here’s a Gallup poll comparison from last March. Note in particular her support among independents – a key voting bloc that Obama won in 2008, but which Democrats lost in the 2010 midterms, as well as with Republicans. Indeed, it is these groups that give her the advantage over Obama; they have roughly equal favorability ratings among Democrats. To be sure, these high favorability numbers will likely drop if she announces her candidacy – but by how much? That’s an empirical question. Keep in mind that although current polling typically has Hillary with a higher favorability rating than Obama, that was not the case in 2007-08, however; then her favorability ratings were consistently 5-10% below Obama’s. However, even in the depths of the 2008 nomination fight, Clinton’s favorability ratings hovered near 50%, about even with her unfavorability ratings, in the Gallup poll. In the CNN polls of registered voters during the 2008 nomination battle she retained even more impressive favorability/unfavorability ratings. So, assuming candidate favorability comes into play at the margins in a close 2012 election – a big assumption – the question we need to ask is whether Clinton’s current advantage in favorability (and approval ratings) over Obama will be sustained, or will it revert to its 2008 component, or will it adjust somewhere in between? Interestingly, in this earlier post Silver suggests a potential answer: looking at the last three presidential elections, he finds a statistically significant if not substantively huge correlation between candidates’ favorability ratings in the six months before the nomination process officially kicks off in Iowa and those candidates’ favorability ratings during the actual post-Iowa primary season. That is, early favorability ratings help predict later ones, up to a point. If Silver is right, Hillary’s current advantage over Obama in favorability ratings may continue through the primary season. Of course, there are all sorts of caveats to this analysis. In particular, should we use favorability ratings of someone who is not a declared candidate as a starting point? And given the not exactly robust correlation between early and late favorability ratings, is the current difference between Clinton and Obama even substantively meaningful? I confess I don’t know the answer to those questions. But without those answers, I cannot, as yet, accept Silver’s argument that Obama is likely to be the strongest Democratic candidate; an equally valid case can be made that Clinton will run stronger. Interestingly, the biggest advantage Clinton is likely to have is precisely the one that Silver cites in Obama’s favor, namely, she would lack the aesthetic and tactical DISadvantages of being an incumbent president! In the end, Obama must run on his record. Clinton can run on the promise of hope and change. In a close election, that might be enough to win.